I hope you guys can help me getting together my Xeon 2690 and my Sabertooth. I would hate to trade it in for an Asrock or something. 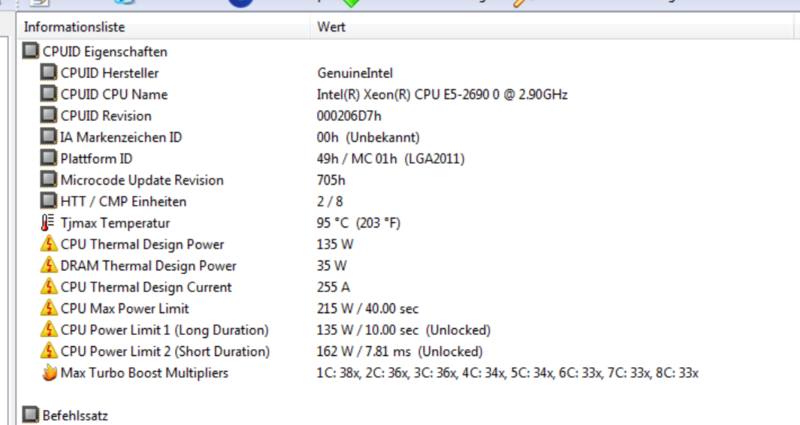 Although the 2690 is not listed in the CPU support list (only the V2 Ivy Bridge) the CPU works. However the turbo mode does not which hurts quite alot with the base clock at only 2.9 Ghz vs. the 3.8 Ghz at turbo mode. The P9X79 WS does offically support the 2690. Additional request: I got my handy on a Intel P3600 DC Pcie SSD with NVME. I dont know if I shall make a separate thread for this or not? Did your load defaults values in BIOS after CPU upgrade? Then run HWMonitor and intense load CPU with hard tasks. Make and post screenshot of HWMonitor. P.S. Your "Additional request" is offtopic here. thanks. I tried it the hole evening and I'm a few steps further: The Asus Board has a somewhat awkward behaviour. As soon as I set the memory on XMP or change the BLCK the turbo mode is automatically disabled. To work around this you have to always go back to AI Tweaker -> CPU Performance and change it back and press F10 to save. No, microcode update can't help in this case.